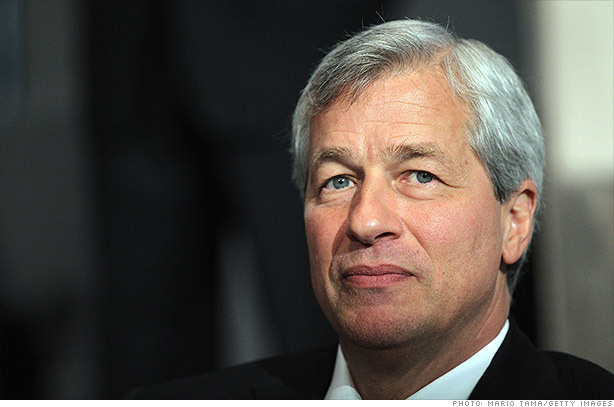 JPMorgan Chase CEO Jamie Dimon is no longer immune from shareholder anger. A group of pension funds want the bank to take away his chairman title. The coalition, which includes the Connecticut Retirement Plans and Trust Funds as well as the New York City Pension Funds, called on the bank to name an independent board chairman. Shareholders will vote on this plan at the company's annual meeting in May. The bank had no comment about the proposal. The pension fund group cited concerns over "the board's oversight in the wake of the London Whale losses, recent regulatory sanctions, and its failure to fully demonstrate that it can manage the size and complexity of its balance sheet." In its press release, the pension coalition cited "clear conflict of interests" when a CEO essentially runs its board of directors as chairman. The group also noted that both the board of directors and Dimon signed off on risk controls that ultimately failed to catch errant trades by the so-called London Whale that have led to at least $6 billion in losses. "Without an independent board chair, JPMorgan will be unable to restore investor confidence and ensure future compliance — both integral to protecting and creating long-term value," said NYC Comptroller John C. Liu, who is investment advisor, custodian, and trustee of the New York City Pension Funds, in the release. It's unclear whether these strong words will affect the shareholder vote. The coalition holds roughly 17 million out of the roughly 3.1 billion JPMorgan shares owned by the public. Last year, the same proposal received support from 40% of the bank's shareholders. Most big company CEOs still serve as the chairman as well. But that is slowly changing. In 2012, 21.5% of S&P 500 firms had an independent chairman, compared to 18.1% in 2010, according to the proxy advisor firm Institutional Shareholder Services. JPMorgan's board has already slashed Dimon's 2012 bonus by 53% -- citing the losses from London Whale trades. The prior year Dimon had been the best paid bank CEO.